The Batcave reappears in The Dark Knight Rises in full working condition. To access the cave, a similar way to Batman Begins, tapping three keys on the piano will reveal a now modernly built elevator which takes the passenger straight to the cave. 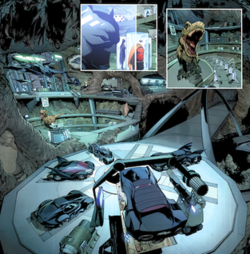 The newest addition to the cave is "The Bat", a flying tank aircraft built by Wayne Enterprises' Applied Science Division and a Batcomputer as well numerous landing pads and a locking case which contains the Batsuit. Added features included that the bridges used to gain access to different sections can be submerged as well as the platforms as a form of security measures in case anyone gains unauthorized access to the cave. While submerged the only visible object is a Batcomputer terminal which can only be accessed by either Bruce or Alfred's fingerprints and an access code. The cave from The Dark Knight appears as well, which contains weapons, supplies, and a back-up Batsuit. After Bruce Wayne is declared legally dead, his will is amended so that John Blake inherits GPS coordinates that lead him to the Batcave. 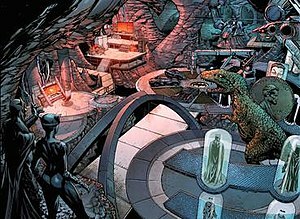 During her debut, Inque managed to infiltrate the Batcave by latching onto the Batmobile and 'riding' it back to the cave, but Bruce was certain that she would never be able to find the cave again as it was a dark night and Terry drives too fast for Inque to have any hope of retracting her steps. Communications tycoon Robert Vance once managed to essentially infiltrate the cave by transferring his mind into the Batsuit, but he promptly departed to pursue his own agenda and was purged from the suit in the subsequent fight. Gossip reporter Ian Peek was also able to access the cave using stolen technology that allowed him to phase through solid matter, but his discovery proved irrelevant when over-use of the technology caused him to become permanently intangible and fall into Earth's core before he could share that information with anyone else. In Batman Beyond: Return of the Joker, the reborn Joker- revealed over the course of the film to be essentially a 'clone' of the deceased villain, his DNA and personality encoded on a microchip in the back of Tim Drake's neck that can take over his body- breaks into the cave and nearly poisons Bruce with the Joker's lethal laughing gas, but his attack provides a clue that helps Terry later determine the true nature of the returned clown, and all evidence suggests that he did not share his knowledge of Batman's true identity even with his new gang owing to his desire to torment his foes privately.